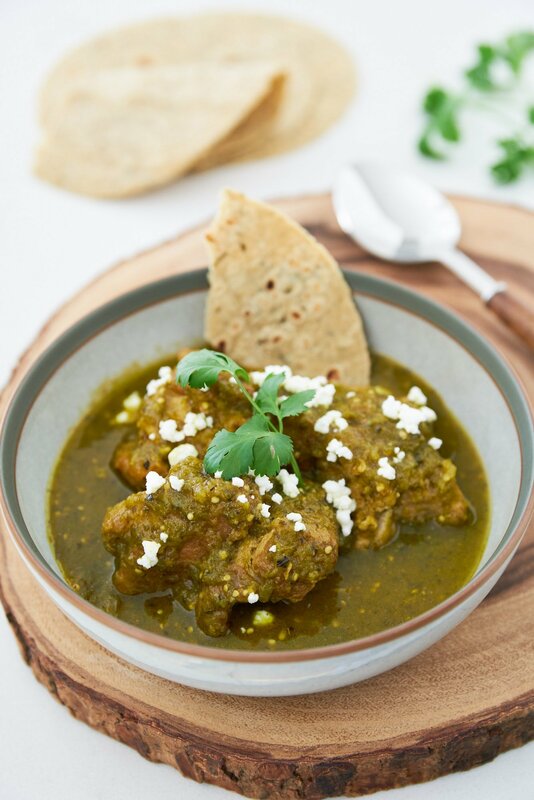 Chile Verde is a comforting Mexican-American stew with melt-in-your-mouth tender chunks of pork in a savory green sauce made from smoky roasted green chili peppers and tangy tomatillos. 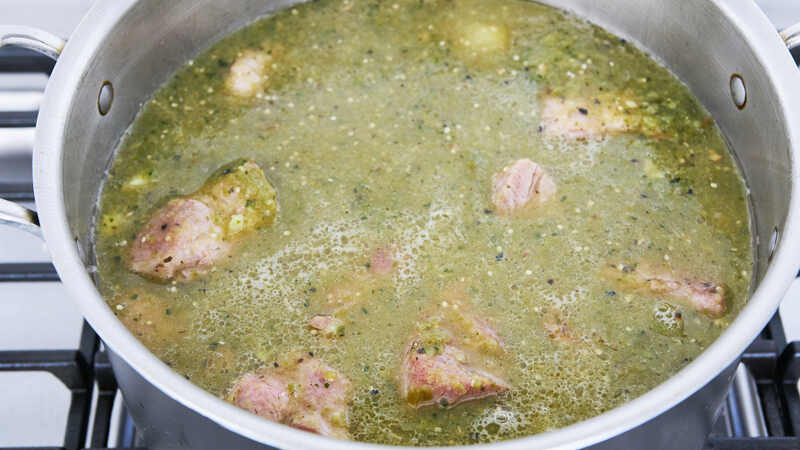 Although we call it Chile Verde (Green Chili) north of the border, the dish is known as Carne De Puerco En Salsa Verde (pork in green sauce) in Mexico. 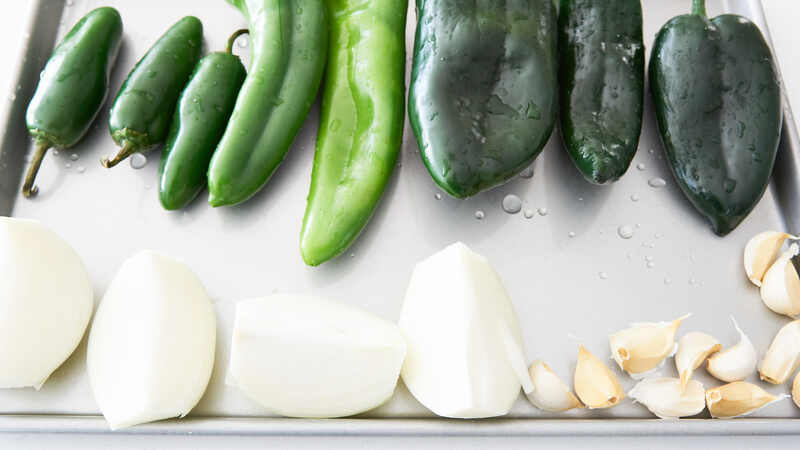 Like many dishes that have worked their way north, such as Migas, and Chile con Carne, Chile Verde has taken some twists and turns turning it into something uniquely delicious. It’s hands-down one of my favorite Mexican-American dishes when properly made, and comfortably makes it into my list of favorite meat dishes as well. Unfortunately, many restaurants take shortcuts. Using canned chiles, or cooking leaner cuts of pork for shorter periods of time, may be more profitable, but they just don’t do this fantastic dish justice. A great Chile Verde has pork that pulls apart with a fork and yet it remains incredibly juicy. The sauce, while comprised of ingredients that are initially pungent, sour, and spicy, mellows out, finding a mouthwatering equilibrium during its slow braise, which adds savory and sweet tastes to the mix as well. Together they make for a comforting stew that’s sublime, bordering on the divine. 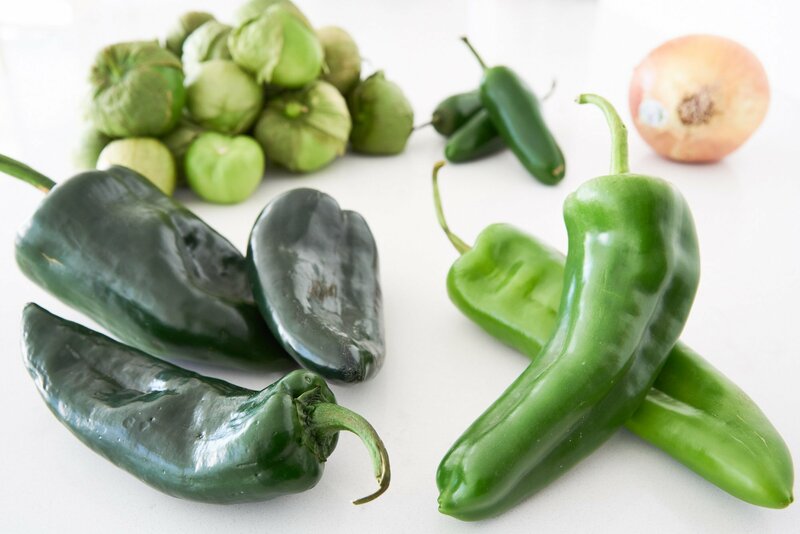 I’ve been working on my Chili Verde recipe for over a decade now, and I have developed a few tricks that turn these ordinary ingredients into something extraordinary. The first is to use a variety of green chili peppers. I like a combination of Poblano chiles for their earthy flavor, Anaheim chiles for their fresh chili flavor and Jalapeños to add heat. My second trick is to brown all the ingredients. This amplifies the inherent umami of each element thanks to the Maillard reaction. It also smoothes off the rough edges of some of the ingredients, bringing out their sweetness while adding depth and complexity to this relatively simple dish. Finally, I like to add a touch of honey. Not enough to make it sweet, but the small amount is enough to reign in the tartness of the tomatillos allowing the flavor of chiles and umami of the pork to shine. While the dish isn’t complicated to make, it does take a while to develop the flavor of the sauce while rendering the pork tender. That’s why one batch should be enough to feed 8-10 people. If you don’t have that many people to feed, don’t worry. The leftovers have so many uses you could make 3-4 meals out of this. Stuffed into masa and rolled in corn husks, this makes amazing tamales. Thinned out with some chicken stock and loaded up with veggies, the Chile Verde makes for an amazing tortilla soup. But perhaps my favorite use of these leftovers is to make Huevos Rancheros Verdes. Wash the Poblano, Anaheim and Jalapeño peppers and cut slits in them to prevent them from popping. Put them on sheet pans along with the garlic, and onions. Remove the husks from the tomatillos and wash them thoroughly to remove as much of the waxy residue from their surface as you can. Cut slits in them to prevent them from popping in the oven and put them on sheet pans as well. 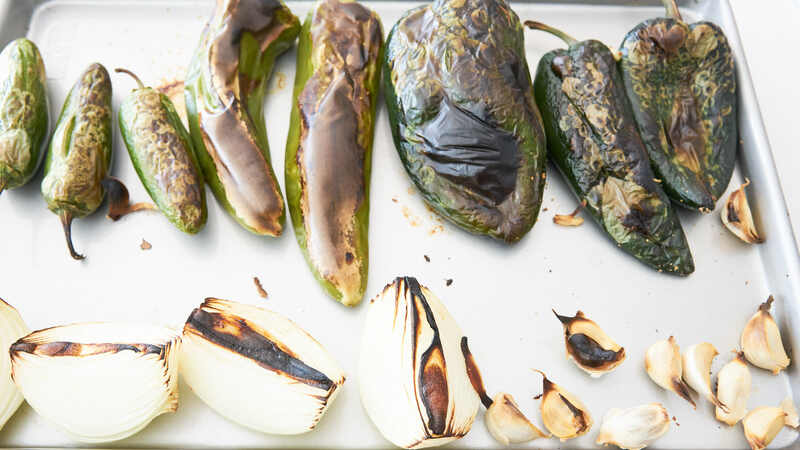 Put the green chili peppers in the oven and roast until the skin has blistered and started to blacken. Flip them over and roast until the second side matches. 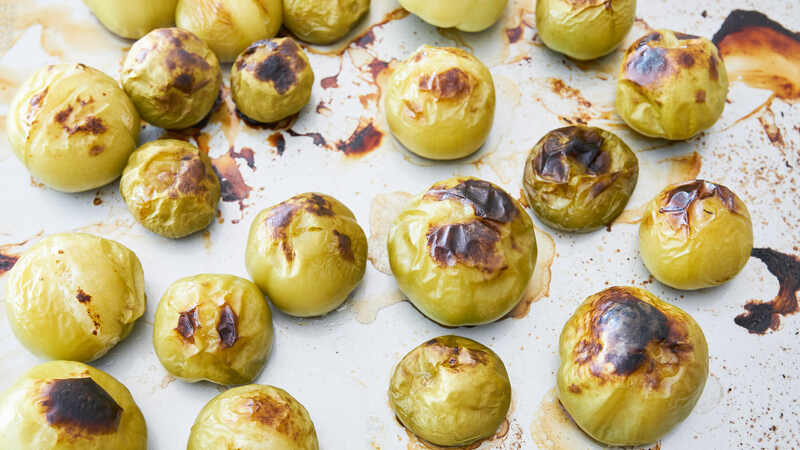 Put the tomatillos in the oven and roast until they're lightly scorched on top. When the green chilies are done, remove them from the oven and let them cool until you can handle them. Remove as much skin as you can from the peppers (you don't have to get it all). Then remove the stems and seeds along with any light-colored membranes. Peel the garlic. Put the roasted green chilies, tomatillos, onions, garlic, and cilantro into a food processor and process until no large chunks are remaining. Heat a large heavy-bottomed pot over medium-high heat until hot. Generously salt and pepper all sides of the pork. 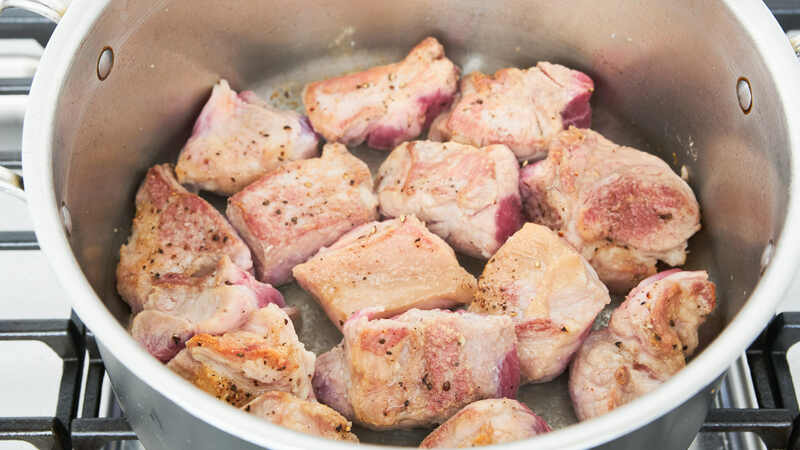 Add the vegetable oil to the preheated pot and add the pork in a single layer, leaving a bit of space between each piece of pork (if it doesn't all fit, then do this in two batches). Let the pork brown on one side undisturbed and then flip and brown the other side. Add the green chili and tomatillo puree to the pot, along with the chicken stock, honey, cinnamon, cumin, oregano, and salt. 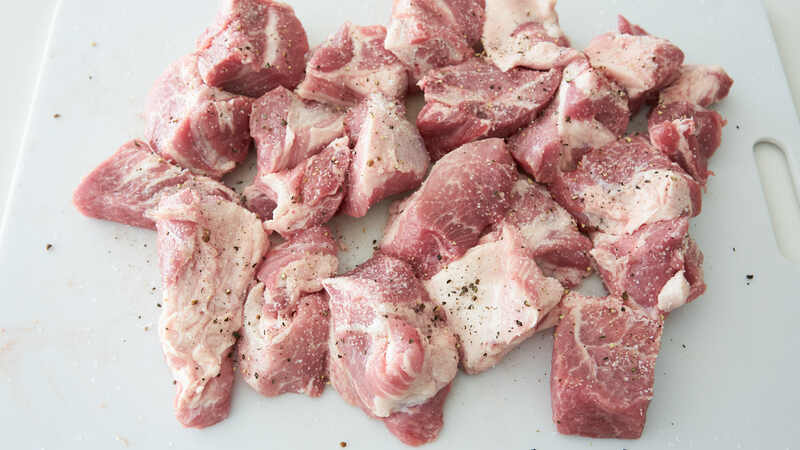 Scrape up the browned bits of pork juice from the bottom of the pot and bring to a boil. Lower the heat and let the Chili Verde simmer until the pork is fall-apart tender (about 2 1/2 hours). Adjust seasoning to taste and serve the Chile Verde with warm tortillas, fresh cilantro and cotija cheese for garnish. Wow! I don’t usually crave savoury food in the morning, especially right after having breakfast, but this makes me hungry! 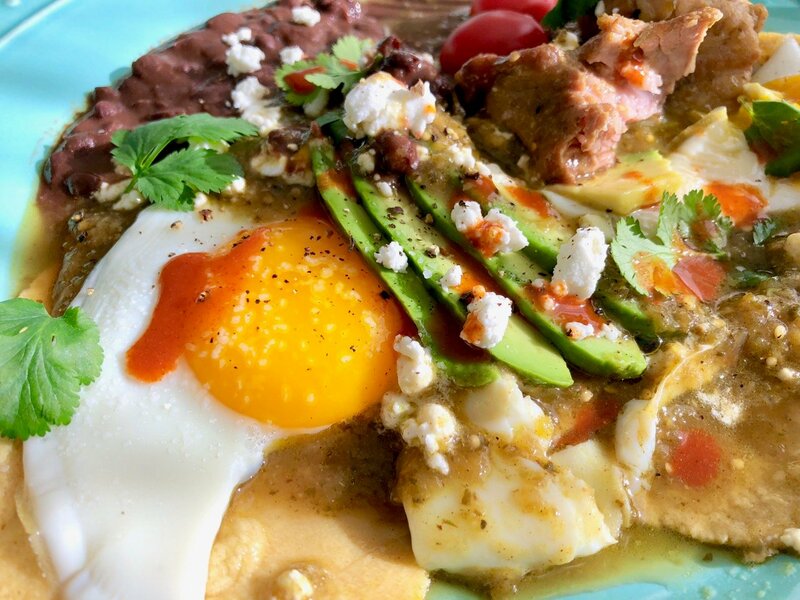 I’m drooling over that Chile Verde con Huevos. I love a nice egg dish. Thanks for sharing! 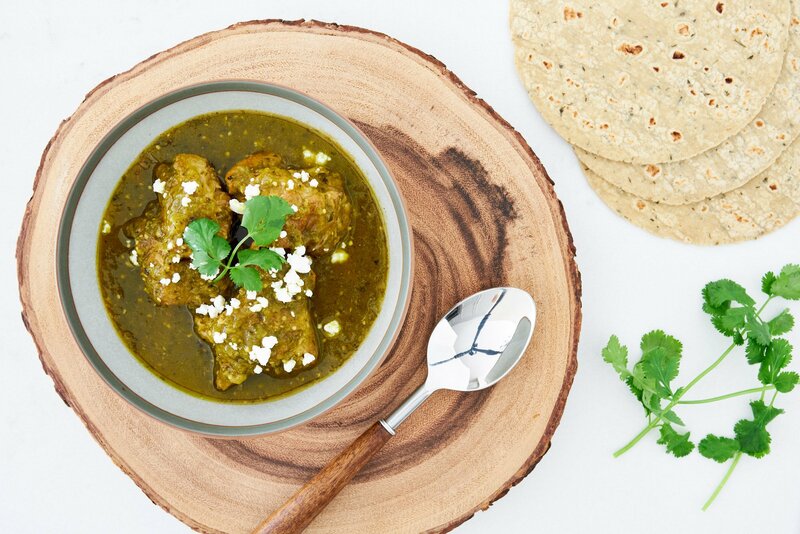 Yum, I LOVE chile verde… I would never think to put honey in it! Thanks for the recipe. Such a wonderful creation! I’d love to see the recipe for home made tortillas. Chile verde is one of my fave dishes. We just made grilled beef tacos last night. So with a stack of tortillas left over, I am so trying this dish. Marc, this is some serious cooking. I love it and will try to make it, but I have to substitute the pork with lamb. My husband is Jewish, so he is not that keen if I cook pork at home. Lamb will be good? We did a quick and lazy/”short-cut-ty” chicken chili verde the other day and I can’t wait to try this dish with pork. The promise of chili verde with eggs is just too tempting for me. Your breakfast plate looks stunning! Perfect way to take on the day. I love chile verde and could wreck that plate with a stack of tortillas. The egg on top is hot secks. The breakfast chili with egg looks amazing!! I won’t have trouble waking up everyday if I have that to look forward to! There isn’t so much a recipe as much as technique (there’s really only 1 ingredient), but I’ll get around to posting it soon. That looks amazing. Have you ever made Arapas? It’s a South American kind of bread. I saw a few weeks ago on Throw Down with Bobby Flay. It’s also made with Masa. Your chili with the Arapas is something I will have to try. I’ll let you know how it comes out! Yes! Chile Verde is right up there at the top of my favorites! I love it too with eggs for breakfast. A good chile verde burrito. I’m glad to see you used tomatillos as a lot of people make this using only green chiles. One of my favorite meals. It looks great! I really like the idea of your recipe. You really seem to know your stuff. I personally wouldnt use olive oil. This is a mexican dish we use manteca (lard) and cilantro leaves plus stems. I wouldnt use honey either but I am sure for people who cant handle the heat that is a good idea to tone it down. This is a nice recipe that is simple enough to put together when the moment hits you, as long as you have access to the peppers. She can come out purdy greazy so you might consider a little leaner cut or drain off a little. Great pictures. Good job, thanks for sharing. In New Mexico we would call this green chile stew, except I don’t think it usually has tomatillos. I’ll have to get some and try it. It depends on the portions you serve, but it should comfortably feed 4. We tried this recipe the other night and really enjoyed the flavors. The only thing is that it turned out too salty. I think 1Tbsp of salt with the pork was what did it. We’re planning to make it again without the salt and then mix the two together, hopefully balancing out the salty-ness. Besides that the dish was really good and we will definitely make it again.